Over the years, legions of ExPats living in the Kingdom and working for Aramco have taken advantage of their close proximity to the famous historical sites of the Middle East to explore their wonders in person. AramcoExPats publisher Vicci Turner was one of them. During her 25 years in Saudi, she parlayed the strategic location of the KSA into visits to Egypt, Jordan, Syria, Iraq, all the Gulf States, and even Yemen. Two of her favorite places were (and remain) the pyramids of Egypt and Petra in Jordan, both of which can be found on lists of the Seven Wonders of the World—one ancient, one new. A recent AXP article dwelt in part on the oldest of that pair, the Great Pyramid of Giza in Egypt, one of the Seven Wonders of the Ancient World. Its six companion wonders of antiquity were: in Mesopotamia, the Hanging Gardens of Babylon; in Greece, the Statue of Zeus at Olympia and the Colossus of Rhodes; in Turkey, the Mausoleum at Halicarnassus (present-day Bodrum) and the Temple of Artemis at Ephesus; in Egypt, the Lighthouse of Alexandria. Of those seven, only the Great Pyramid remains standing, although scuba-diving French archaeologists located submerged remains of the Alexandria lighthouse in 1994. Spurred on by that discovery, plans are underway to create an underwater museum there. Deciding that one visible Wonder was not enough and that a new list of seven was needed, in 2007 a Swiss company calling itself the New 7 Wonders Foundation held an online contest in which it claims 100 million people voted—if true, making it the largest opinion survey in history. The seven new wonders chosen by popular vote were: in China, the Great Wall; in India, the Taj Mahal; in Italy, the Colosseum of Rome; in Brazil, the Christ the Redeemer statue in Rio de Janeiro; in México, Chichén Itzá; in Peru, Machu Picchu; in Jordan, Petra. The Great Pyramid was named an eighth honorary member of that list as the last remaining Wonder of the original septet. Petra has often been described as having once been a “Lost City,” but that is a misnomer. It was never lost to the Bedouin tribes that called it home, nor to Greek Christian families living in the area. It was simply far removed from popular transportation routes, tucked away in a region considered unsafe for outsiders to visit. As a consequence, its location remained a closely-guarded secret for centuries until 1812. In August of that year, a daring Swiss scholar named Johann Ludwig Burckhardt, speaking flawless Arabic, reached Petra disguised as an Arab pilgrim from India, thus becoming the first European in hundreds of years to view this magical place. Drawing near to Petra’s rumored site, Burckhardt hired a local Bedouin to be his guide, paying him “with a pair of old horseshoes” to lead him the final few miles to his ultimate destination. Modern-day visitors to Petra face none of the safety concerns that bedeviled Burckhardt two centuries ago. They can easily travel there in air-conditioned comfort without armed guards, and the local Bedouins will gladly welcome them. Be aware, however, should you decide to visit Jordan and Petra yourself, that any guides you hire will expect to be paid in currency or by credit card, not with old horseshoes. Times have changed. Historians trace the earliest signs of human life at the site back to the Neolithic age over 10,000 years ago, thousands of years before the generally recognized “dawn of civilization” in the nearby Fertile Crescent. No one knows for certain exactly where the Arab tribe we know as the Nabateans came from. What we do know for certain is that, sometime around 400 BCE, they settled into the region where present-day Petra is located. Among their greatest accomplishments, they developed a system of writing said to be the basis of written Arabic. Petra derived its riches in good part from its strategic location astride one of the most important trade routes of the ancient world stretching from the Mediterranean basin all the way to China. A steady stream of caravans laden mostly with frankincense and myrrh from the southern Arabian Peninsula and, to a lesser degree with spices, silks, and other goods from India, Sri Lanka, and eastern lands beyond, passed directly through Petra on their way to the Mediterranean world of Egypt and Rome and Greece. Caravans moved as well in the opposite direction, bearing primarily silver and gold, but also carpets and tapestries, furs and coral, wine and papyrus, and other items of value needed to pay for more aromatics, spices, silks, and such. Trade on the ancient incense, spice, and silk routes, it is sometimes forgotten, was a two-way street. Over a span of 400 years, operating from Petra, the Nabataeans dominated the primary trade routes linking Rome and the Far East, carefully guarding the identity of their sources of goods. Essential to their success was the system of water collection and distribution they created which freed them and the trading caravans they served from dependence on scattered desert oases and the fiercely independent tribes that controlled them. At Petra, the Nabataeans carved a 300-foot long tunnel to divert water from flash floods into two large cisterns—also carved out of solid rock. That water was then used to supply the city’s needs. With advancements in ship design and the invention of better navigation tools, the importance of sea routes to trade waxed and the predominance of the Arabian land routes waned. Inexorably, gradually, the Nabataean Empire faded away, becoming the stuff of legends. 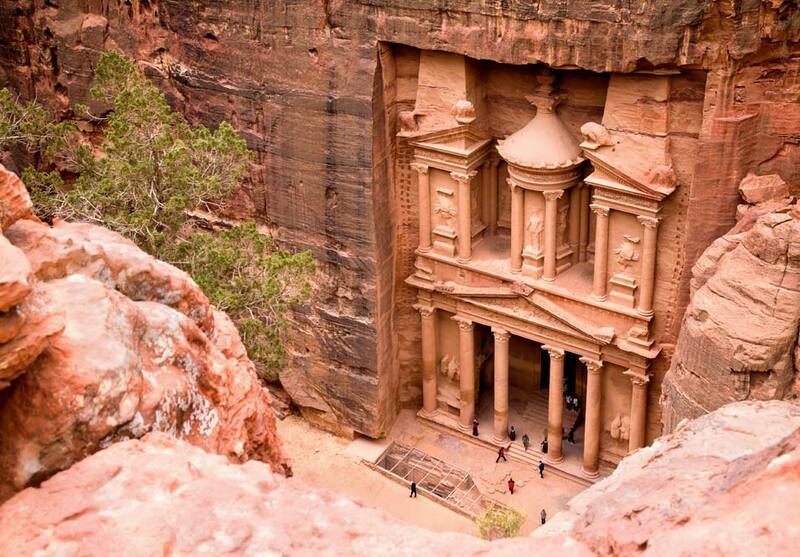 Finally, a full millennium after its birth, Petra was abandoned and, in time, the legend of the “Lost City” emerged. Then, in 1812, along came Johann Burckhardt, and the city was reborn, eventually developing into what it is today, one of the new Seven Wonders of the World. Siq – This impossibly deep, narrow, three-quarters-of-a-mile-long gorge has served for over 2,000 years as the main entrance to Petra. At its narrowest point, two camels can barely pass through side by side. You can walk, take a cart, or ride a camel, but one way or another, you must traverse the entire length of the Siq. Along the way, you’ll see colorful, bizarre rock formations and an impressive display of the Nabataeans’ architectural wizardry expressed in the many channels, dams, and niches carved into the soft rock. Petra received a major boost in global recognition in 1989 when the finale of the Harrison Ford/Sean Connery movie Indiana Jones and the Last Crusade was filmed there. Two scenes from the finale depict Ford, Connery, Denholm Elliott, and John Rhys-Davies galloping on horseback through the Siq. The Treasury (al-Khazna) – As you near the end of your entrance into Petra via the Siq, the imposing façade of the Treasury will start coming into view. Carved into the rock in the 1st century CE, this 140-foot-tall marvel was originally meant to serve as the tomb for a Nabataean king. Later it was used as a temple. Visitors today are not allowed inside as a cautionary measure to prevent possible damage. Still, the outside view is amazing. It’s widely considered the most beautiful and best-preserved monument in Petra. The Monastery (Al Dayr) – Similar in design to the Treasury but on a grander scale, the Monastery was originally a tomb and dates from the 3rd century BCE. Accessing it requires a hike up a flight of 800 steps cut directly into the rock. Allow yourself as much as an hour to reach the top, giving you enough time to pause every now and then along the way to admire the matchless scenery. If you prefer to ride, not walk, you can hitch a ride on a donkey for a modest price (in Jordanian currency, remember, not used horseshoes). The Monastery is a perfect example of the classic Nabataean architectural style. Street of Façades – Beyond the Treasury, the passage widens out into what is known as the Outer Siq. More than 40 tombs and houses have been carved into the rock walls, each one sporting its own unique design. Royal Tombs – The Royal Tombs were originally built to house the remains of Nabataean nobility. The largest of them, the Urn Tomb, features a recessed façade and a below-grade vault believed to have once served as a prison. Originally built as the tomb of a king, it was later converted into a church. High Place of Sacrifice – Petra has several “high places” to choose from, and you owe it to yourself to pick at least one. This is the most accessible and best preserved of the lot. It sits atop Jebel Madbah and was used as a platform for sacrificing animals during religious rites. You again have a choice of walking up and down on foot or ascending and descending by donkey. The Great Temple – Rescued from what were once considered salvageable piles of rubble, the Great Temple has slowly taken shape over the past 15 years thanks to the boundless energy and gritty determination of an archaeologist from Brown University, Martha Sharp Joukowsky. Built between the first century BCE and the first century CE, the Great Temple Complex includes a theater, a triple colonnade, and an enormous paved courtyard with vaulted rooms underneath. 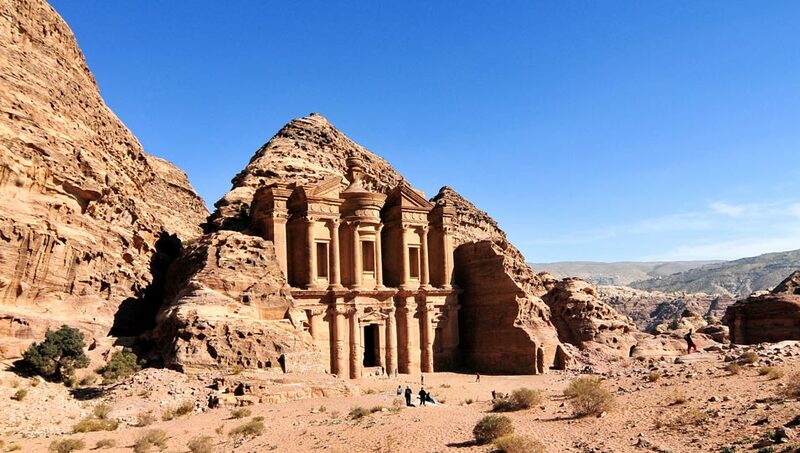 The recent discovery of the Great Temple Complex, previously hidden from view, using data collected from satellite images and archaeological survey drones, has raised hopes in Jordan that Petra might someday attract tourists from afar in numbers commensurate with its splendor and fame. The Bedouins Vicci remembers were members of the B’doul tribe, “B’Doul” meaning “switched” in Arabic. Tradition holds that they got their name when they switched their faith from paganism to Islam in the 7th century CE. Tribal members consider themselves direct descendants of the ancient Nabataeans who originally founded Petra over 2,000 years ago. In the mid-1980s, Petra was named a UNESCO World Heritage site, and the B’doul were compelled to leave their cave life behind and relocate to modern housing in the newly-built settlement of Umm Sayhoun, a short distance away. Today, many of them serve as tourist guides, while others regale visitors with displays of local color, including music, handicrafts, and donkey and camel rides. Tourism now provides the B’doul with their primary source of livelihood, a considerable change from the semi-nomadic life they lived for centuries before modernity and hordes of tourists caught up with them. Another annuitant of note who once visited Petra is Bert Seal, the beloved photographer known for his splendid images capturing the history of Aramco and its people. AXP is pleased to feature Bert’s gorgeous photographs of Petra as accompaniments to this article. They explain better than these words ever could the magic of Petra, one of the new Seven Wonders of the World. The feature article of AXP’s e-newsletter of 3 October 2018 concerned the kellek, a raft supported by inflated animal skins commonly used at one time throughout the Middle East, but especially on the Tigris and Euphrates rivers in Mesopotamia. Coincidentally, the kellek had a modest part to play in the drama that was Petra and the ancient spice trade. For four centuries, the Nabataeans had a choke hold on caravans bearing treasures across the Peninsula. Inevitably, some traders, rebelling at having to pay for passage, tried to find ways around that land-based monopoly and turned to the sea. At the far southern tip of the Arabian Peninsula, smugglers employed rafts supported by inflated animal skins—i.e., kelleks—to surreptitiously ferry contraband goods (primarily frankincense and myrrh) to ships anchored offshore. Those ships then bore their precious cargoes northward up the Red Sea to ports in Egypt, thereby circumventing Petra and its sister Nabataean cities along the traditional overland caravan route. In time, the ocean routes won that battle, and Petra faded from history, for many centuries the light of southern Arabia.